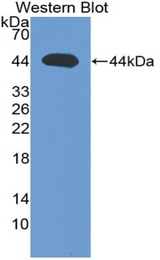 TGF Beta3 antibody LS-C693234 is an FITC-conjugated rabbit polyclonal antibody to TGF Beta3 (TGFB3) from bovine and cow. Validated for WB. Recombinant TGFb3 (Glu314-Ala412) expressed in E. coli. Western blot of recombinant TGFB3.